Your bedroom is a place to relax, unwind, sleep and chill out so why not treat yourself this season and give your home a Winter bedroom makeover. You don’t have to go all out and change up your room completely (though you can if you like). You can easily make some simple modifications and add a few little touches to give your room that seasonal feel. If you are looking to go all out then exposed solid wood flooring is a must. If that is a bit too expensive, cheap laminate flooring will do just as nicely. If you have a good supplier it will look just like the real deal and is much more affordable. Another good tip is wall colour. A nice clean white, deep blue or slate grey are all great wintery colours and will be sure to make your furniture and accessories pop, in all the right ways. Try Farrow and Ball for some lovely neutral colours. 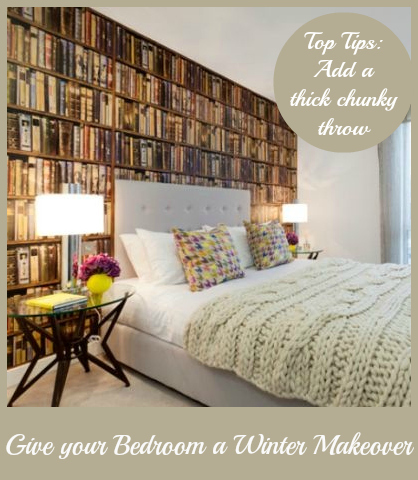 Anyway, if you just want to stick to the basics here are a few good makeover tips that will make your bedroom a haven of winter wonder in no time! The bed is a central feature of the room. Keeping your linens plain and throwing over a deep coloured chunky blanket will be sure to add a touch of warmth to the room. Pair that blanket with a similar coloured or matching rug and you will have a symmetry that is altogether very satisfying. Adding a few cushions in tones that match as well, will further the look or if you feel daring, why not add some brightly coloured cushions into the mix. Blues, reds, browns and greens are all great winter colours. Another great option is adding a classic patchwork quilt or blanket. This look never fails to brighten a room and it is also very seasonal. If you are going for this look – be sure to pair it with a neutral coloured rug. 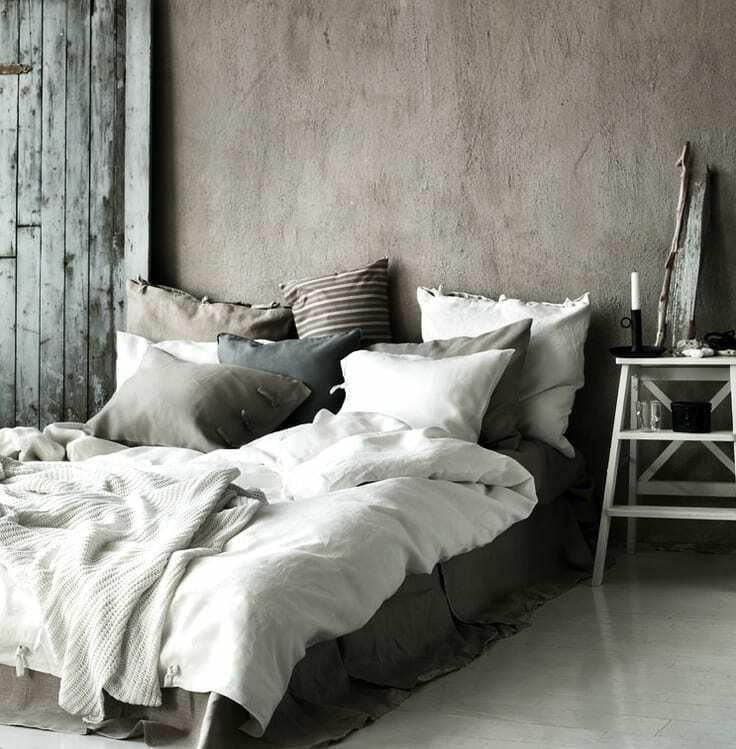 Dark blues, greys and browns all work well and a shaggy cream rug would also work a treat. You can easily find cheap rugs and it is worth it as they really make the perfect accessory and add warmth to the room. 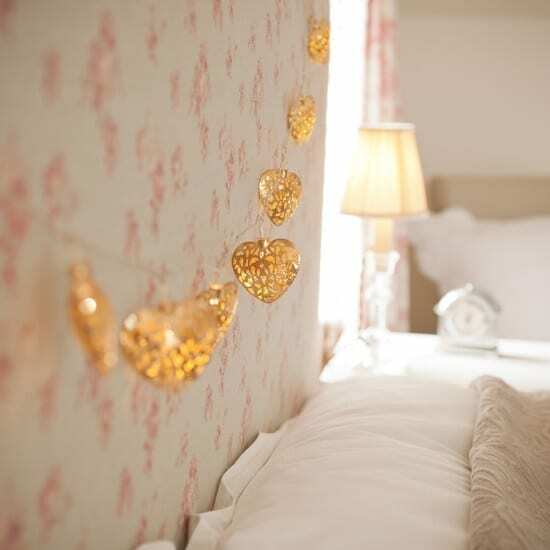 Wrapping white fairy lights round the head board of your bed instantly gives your room a magical feel. The soft lighting is perfect for setting a very chilled out mood and it always looks gorgeous. Coloured fairy lights near windows and used as an almost border along one of your walls will add colour, beauty, magic and a sense of whimsy to your room. There is something very lovely about knowing that you have created something that makes your room a little bit more beautiful. Your winter makeover accessories don’t have to be complicated, they can be as simple as lacing a few shelves with some old sparkly Christmas decorations or putting a few pine cones in a clear jar. Or like the above you could create a wintery arrangement. 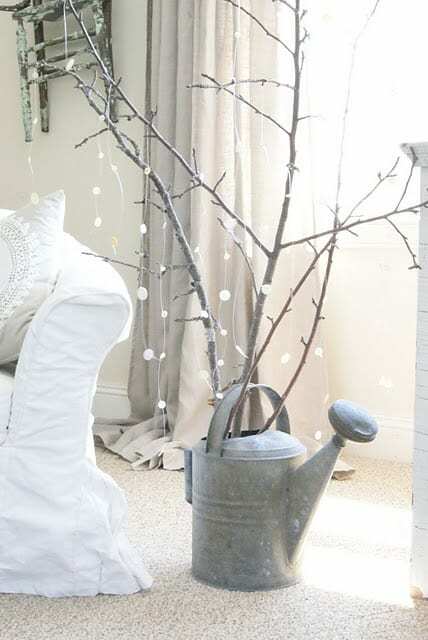 The one above uses a couple of branches in an old watering can with white buttons on string draped over them. It is effective as the buttons give the appearance of snow. Simple, beautiful and lovely. How will you decorate your bedroom this winter? Great ideas! 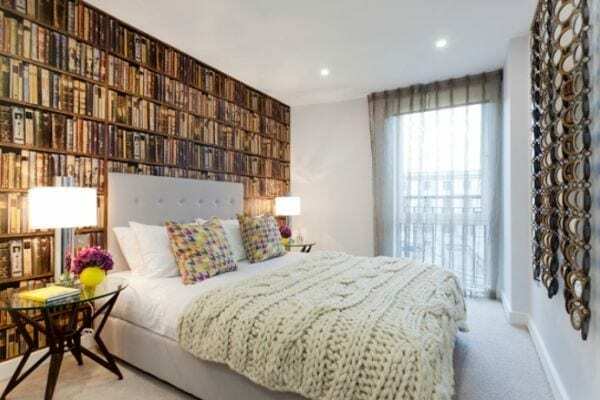 I absolutely love the book wall feature…I wonder if I can convince the Hubster to create one in our bedroom?! Failing that I love big chunky knitted blankets and fairy lights…perfect for these early dark evenings.